I find it hard to believe we are saying good-bye to another year tonight and welcoming in 2017. I swear, the older I get, the faster 12 months seems to fly by. 2016 was a very interesting year. The United States voted in a new President, which was a surprise to many of us, and we lost many beloved entertainers way too soon. And although 2016 was challenging after losing so many talented people, especially great musicians, it was a great year for wine. At least it was for me, and I tried some fantastic new wines in a wide price range. This is my favorite ‘deal’ that I found in 2016 and I enjoyed a bottle last night. The Farmers of Wine from Italy is a steal at just $15.99 a bottle. The 3 farmers that contributes to the wine are 66, 75 and 86 years old, and each have been growing grapes for many years. The vines that the grapes were grown on ranges from 30 years old up to 100 years old. The story of the wine is found in their hands, and was conceived to celebrate a lifetime of hard word that these farmers from Puglia have contributed to the wine world. It is a blend of mostly Primitivo (a.k.a. Zinfandel) and Negromara. And it has become a staple in my wine rack. 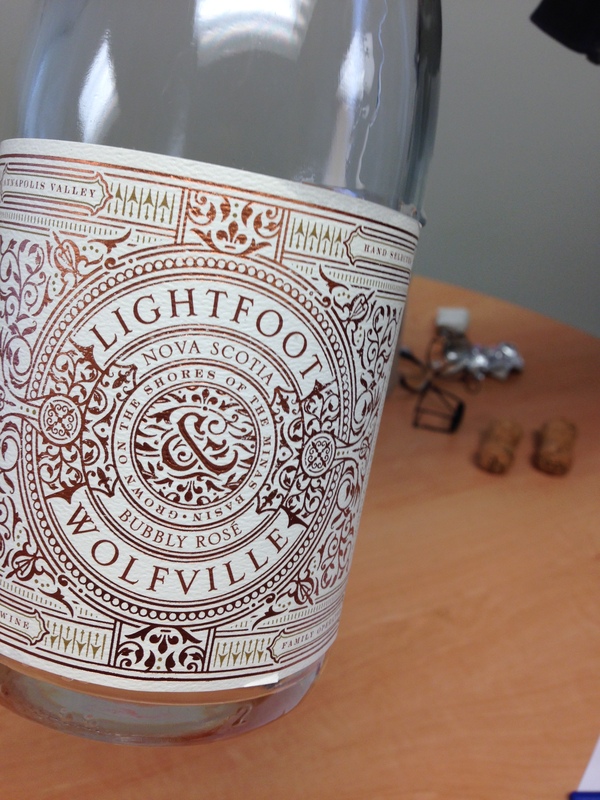 My favorite Rose wine from the past year was a local find, the Lightfoot & Wolfville from right here in Nova Scotia. It has a slight hint of effervescence, and a light fruity palate. This lovely wine is a blend of Pinot Meunier, Geisenheim and L’Acadie and the vineyard is fairly new, being established in 2009. I also had the opportunity to try their Chardonnay and it is world class. I love everything about this wine from the pretty label to the wine inside the bottle. 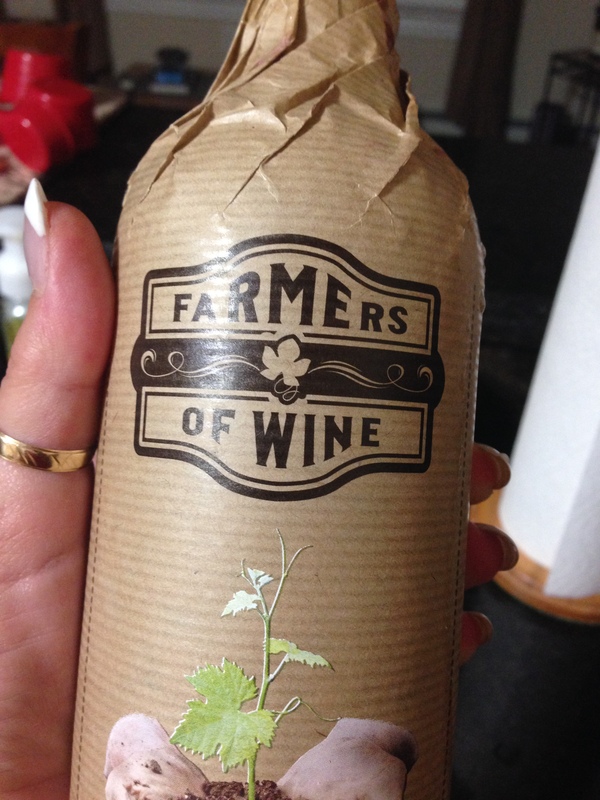 My favorite dessert wine this year is a sweetheart…. and I mean that literally. 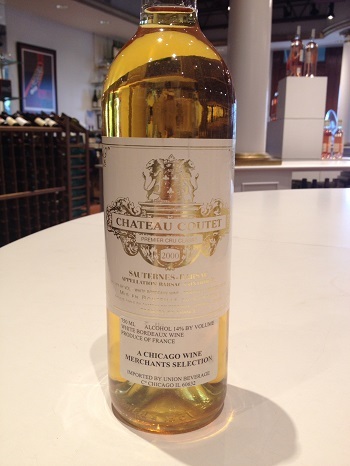 It is the 2000 Chateau Coutet AOC Sauternes and it was a piece of heaven in my mouth. Hailing from the Graves region of Bordeaux France, this wine exudes everything great about noble rot, which is what is needed to make this delicious sweet wine and bring out the rich flavors of marmalade and vanilla. It’s a fantastic dessert wine and definitely worth the treat of $65.99! My favorite white wine of the year was from Canada as well, and hails from the Prince Edward County region of Ontario. The Norman Hardie unfiltered Chardonnay from the year 2014 was done in Burgundian style and it was done to perfection. When I say Burgundian style I mean the oak doesn’t overpower the wine, as can sometimes be the case with Chardonnay. 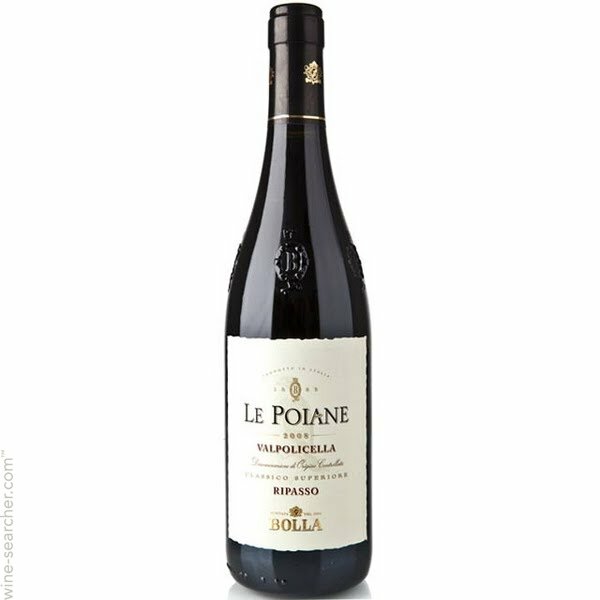 It is aged in French oak, which brings subtle nuances of oak and although it was unfiltered, there was no sediment in the wine. The wine taster however, referred to it as being ‘alive’. I thought that was a very neat way to describe a wine. I had a tough time picking my favorite red…. I had tried some really good ones on for the past year. Here are the runners up! 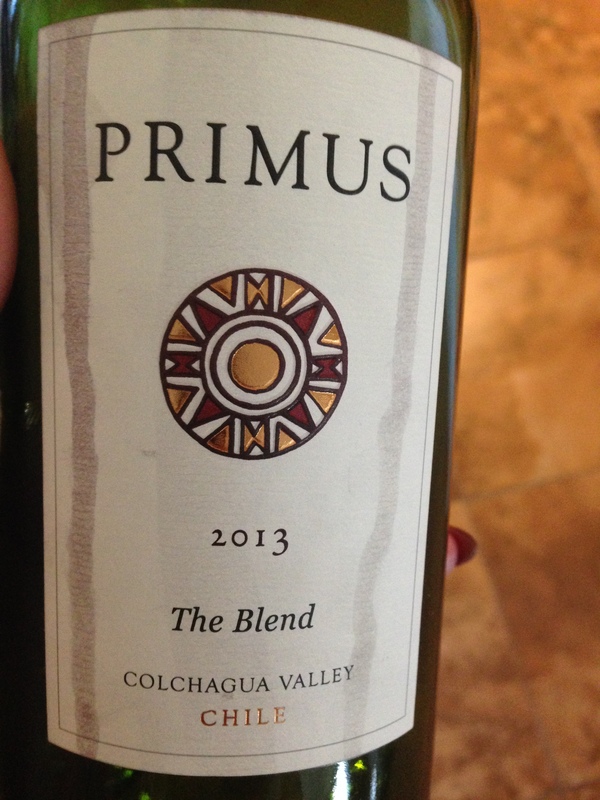 The Primus Blend from Chile is spectacular and made from 4 different grape varieties, Cabernet Sauvignon, Carmenere, Syrah and Merlot. It represents the quality of wine that is coming from Chile. The grapes are hand-picked and then done in a Bordeaux style, or a ‘Meritage’ style, as it is referred to in New World Wines. It is $24.99 and a great deal for the money. 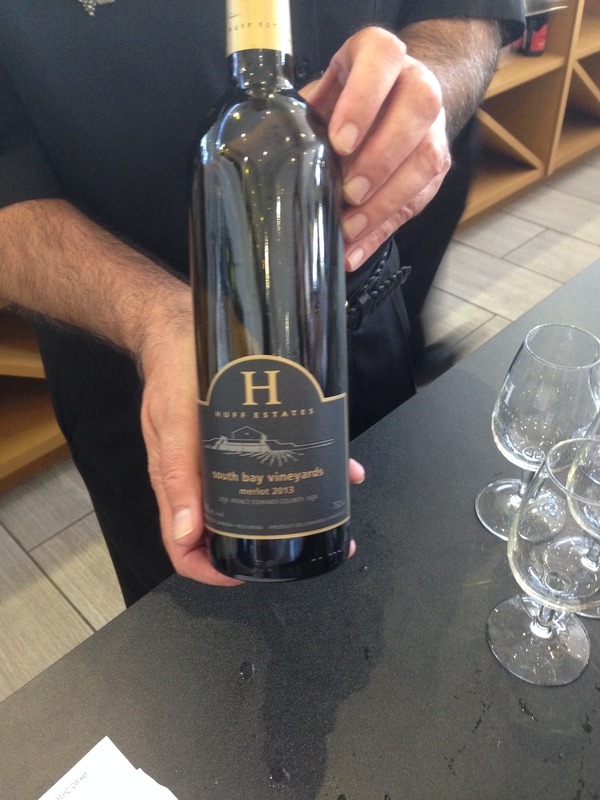 This South Bay Merlot from Huff Winery in Ontario also made the list. I fell in love with the 2013 Merlot and I’m going to quote my wine blog from when I first tasted it. The Renwood Zinfandel from California is my go-to Zinfandel wine. It is made from the same people who bring us The Cleaver Red Blend and it is Zinfandel done at its finest. Abundant fruit and notes of black pepper and smoke, it’s hard to believe they started to produce wine in 1993, which makes them fairly young in the wine world. If at any time, you are grilling BBQ ribs, this is your wine. It goes great with anything on the grill, as well chicken and turkey, and delicious drinking all on its own, but BBQ ribs is definitely where this wine would shine the brightest. I would like to take this opportunity to say thank you and a Happy New Year to all the readers of my blog. We live in busy times and I really appreciate each and everyone of you taking the time when you can to read my thoughts on wine. Play it safe tonight and if like me you’re going to enjoy a glass of wine or two,please don’t drink and drive! 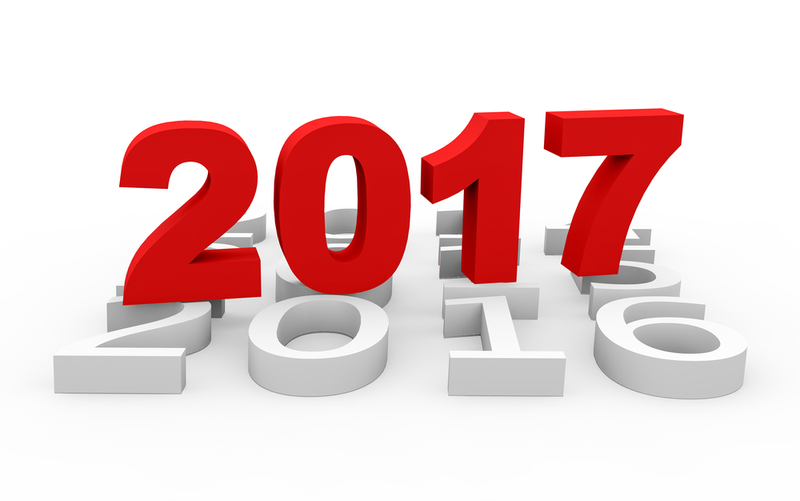 The very best to you in 2017! You’re going to need it! I live in a fairly mild area of Canada. Besides Vancouver and that part of the West Coast of Canada, Halifax is one of the mildest areas of Canada winter wise. However, this week we have had not one but two storm days, as well as a couple of days of -30 degree temperatures. I even had to venture out in a storm to get more wine. So, I have some advice to give… stock up. Storms can come out of nowhere, and you don’t want to be stuck shorthanded in the wine department. 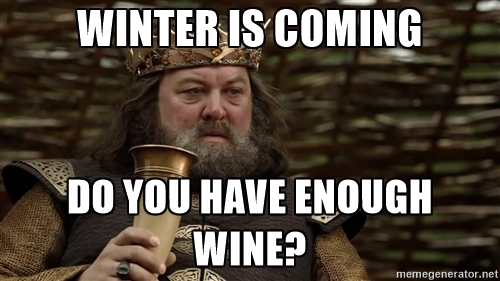 I think this is the best meme I’ve seen in a while, as it relates to wine. So this week I thought I would share with you what my winter stock pile looks like. Always have a sparkling wine on hand, especially for the Christmas season. And if you don’t want to pay the price tag of a Champagne, there are lots of other options. I love an Italian Prosecco and I also love Cava, which is a Spanish sparkling wine and very affordable. 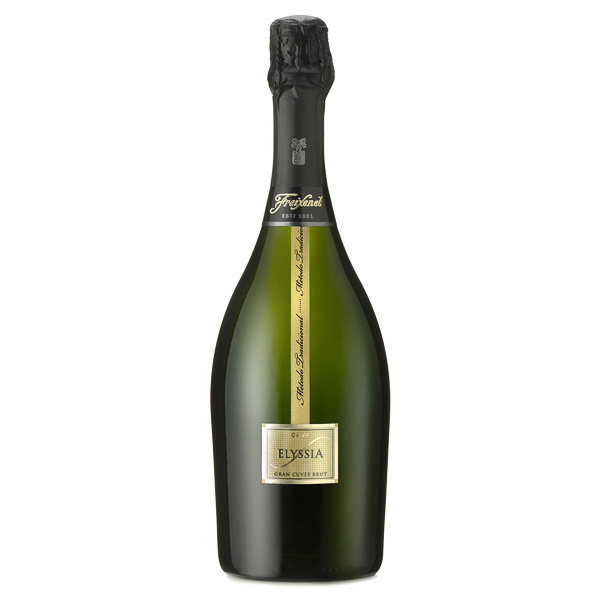 This is the Freixenet Elyssia Gran Cuvee and its crisp and light and perfect for special occasions. Made from Pinot Noir, the wine is white because it doesn’t make contact with the skins. Won’t break the bank this holiday season as it sells for just $24.99. I also always have a dessert wine on hand, and this one made right here in Nova Scotia is one of my favourites. The Borealis from Benjamin Bridge is rich and decadent and in my opinion is better than chocolate. Gorgeous flavours of apricots and honey that stay with you. It’s the perfect complement after a big meal when you need something sweet. 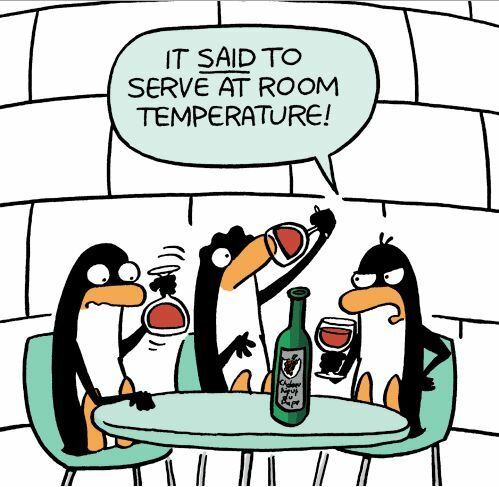 I guarantee you there is always a Zinfandel in my wine rack! This is becoming one of the favourites of my friends. 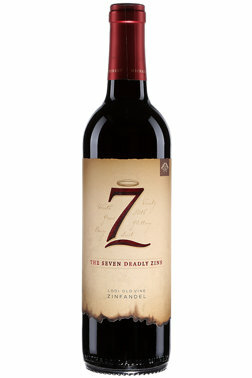 Seven Deadly Zins is made up of Zinfandel grapes from 7 different grape growing vineyards in California and dances on the palate with those great Zinfandel flavours – hints of raspberry and a touch of vanilla. There is also always a Cabernet Sauvignon in my wine rack and this one is my wine of the week…. 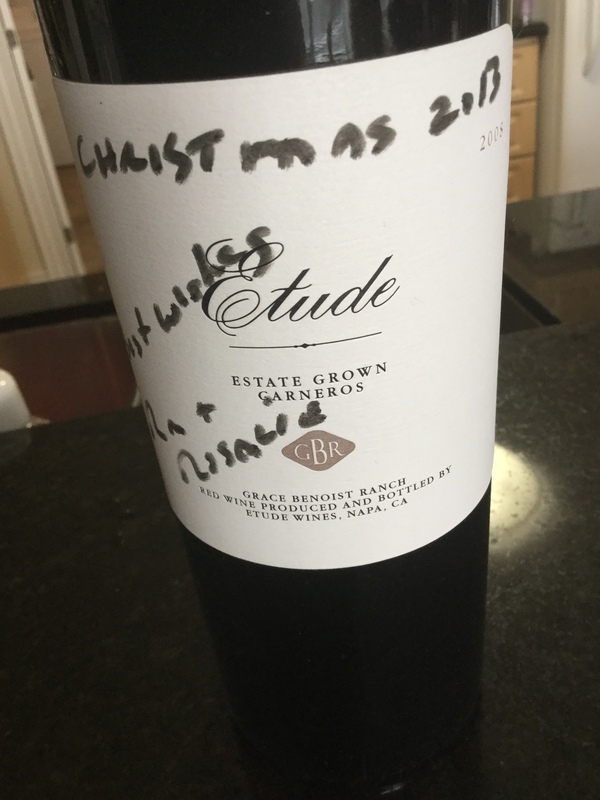 As you can see the Etude Cabernet Sauvignon was a gift from some very dear friends and I loved it. RIch and tasty with hints of Winter spice itis a fantastic Cabernet Sauvignon with notes of licorice and blackberry. If you were going to take a break from turkey this year and have a nice piece of beef, treat yourself to this wine. Well that’s it for me for this week. Next Saturday is Christmas Eve and I probably won’t have a wine blog as I am heading off to Newfounfland tomorrow morning. 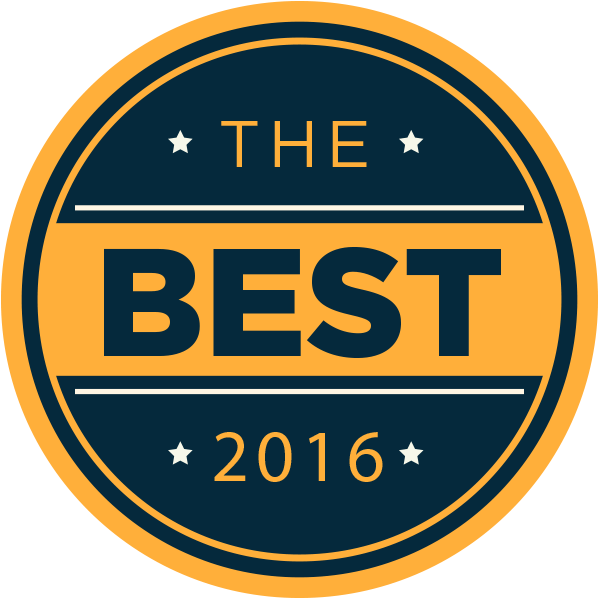 I am however looking forward to my end of the year wine blog in which I will tell you my favourites of 2016 . Stay warm folks and Merry Christmas, and here’s to a safe and happy holiday season. 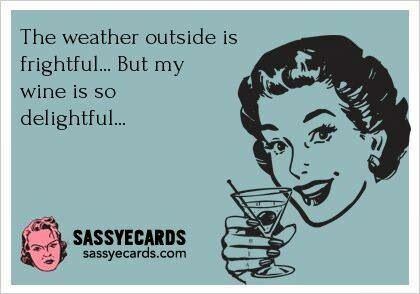 And I’m not talking about snow either! 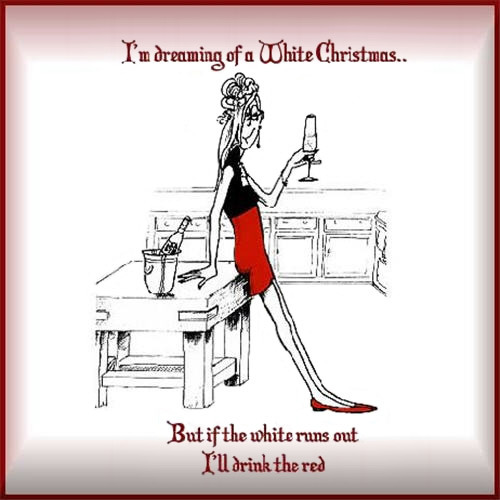 And although I’m dreaming of a white Christmas, wine that is, I would never pass up a glass of red this holiday season. After all, red goes with just about everything! If you are dreaming of a white Christmas, try this fun, easy to drink wine. The Jacob’s Creek Moscato is an effervescent wine that comes in both white and Rose. Off dry and fruity, the white boasts peach and honeysuckle flavors and the Rose is very similar with hints of candy on the nose. They are very reasonably priced at just $13.49 a bottle, so we can afford to crack open more than one. 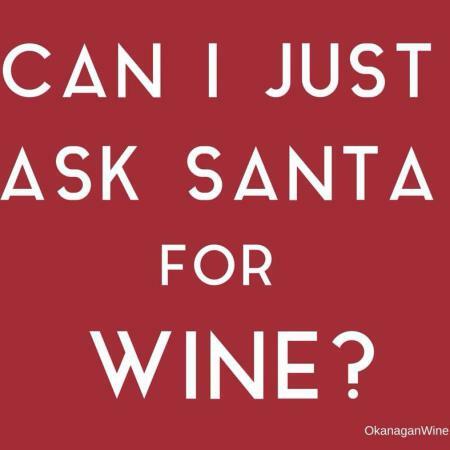 And they are a great wine to pair with appetizers and Christmas party snacking foods like cheese balls. I had this one the other night and it’s been a couple of months. And for the life of me I can’t figure out why! It’s a great wine at a great price $16.99 per bottle, but it tastes like a $25 bottle of wine. 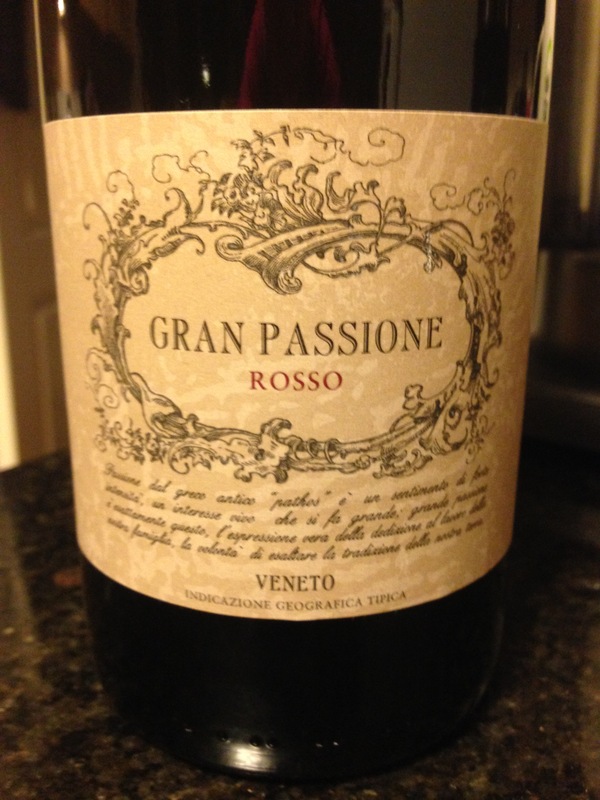 A blend of Merlot and Corvina, Corvina being a grape mostly grown in the Veneto region of northeastern Italy. It’s a wine that comes from an old world country, Italy, but with new world nuances. The fruit on the wine is very rich and it also has notes of vanilla and licorice. Here’s a great white wine to get you out of any winter doldrums It even contains the word sun in the name. Mer Soleil means “Sea Sun” and is named after the sea and the sun. This one is created by a fifth generation winemaker and Charlie Wagner makes a great Chardonnay. 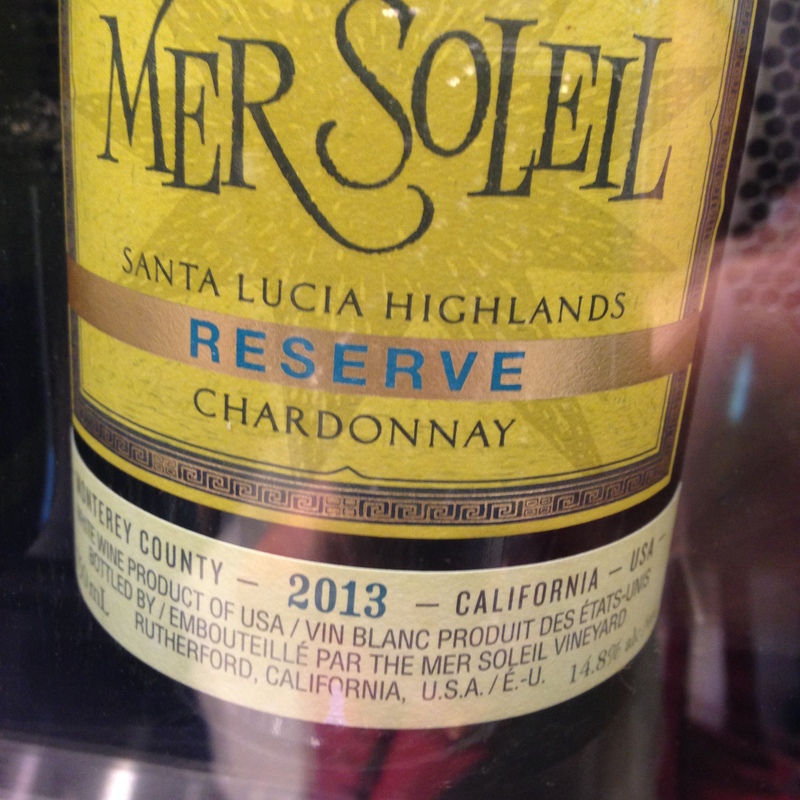 Tropical fruit with a lemony freshness and buttered toast notes….its a winner! 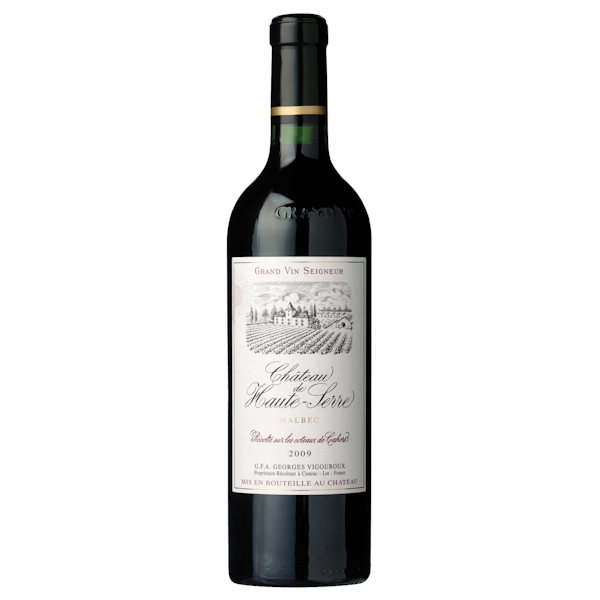 The 2009 Chateau Haute Serre is a spectacular Malbec from the Cahors region of France. Although Malbec has become the iconic grape of Argentina, it originated in the Cahors region of southwestern France. This wine has great fruit which you will notice right away with its deep purple color, complimented with spice and woodsy notes. A great wine to pair with those comfort foods of Winter! Can you believe we are in the last month of the year for 2016. The term ‘time flies’ is starting to scare me a little because it flies a bit too fast. 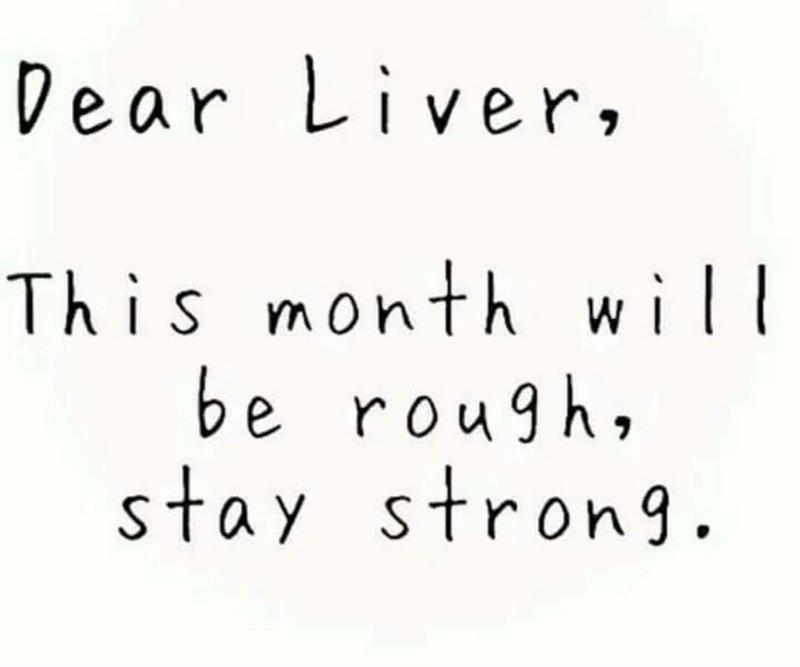 I do, however, love the month of December. I love how my home looks. 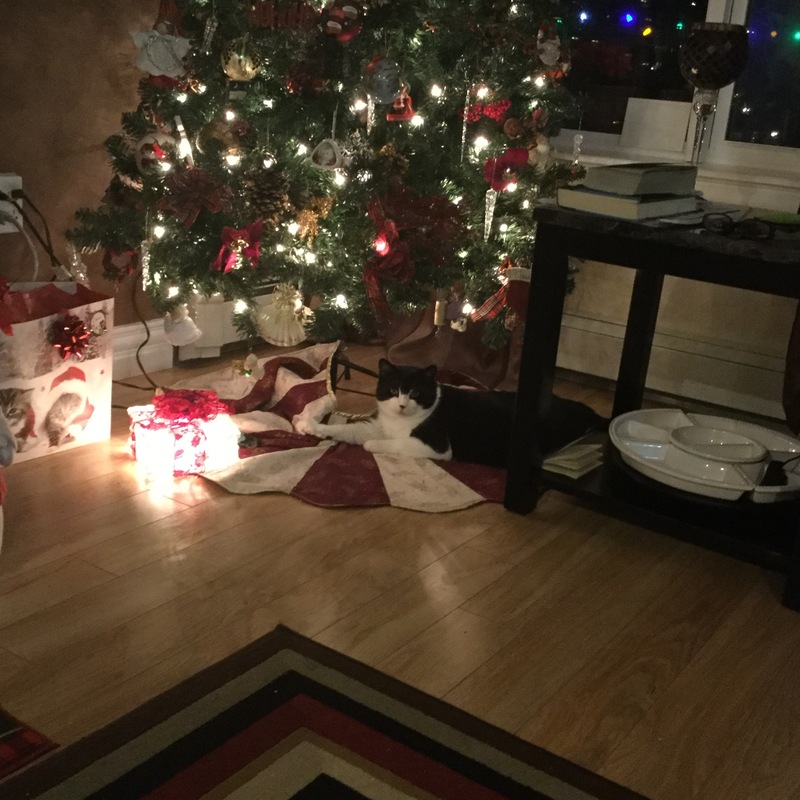 I love how Leo looks cuddling under my Christmas tree. That’s Leo. 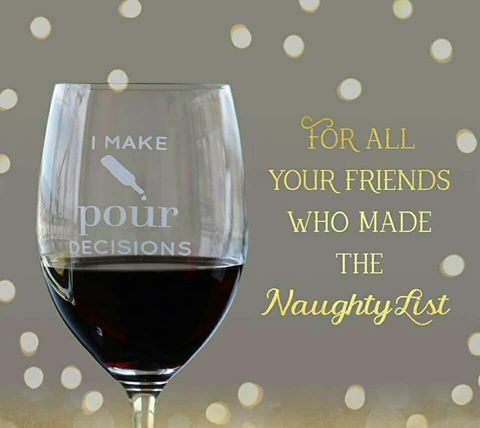 And I love getting together with family and friends to enjoy the holidays and enjoy a nice glass of wine. This is a great time to try new wines, as friends are dropping over with wine you haven’t tried before, and you could also bring something new the next time you go visiting. 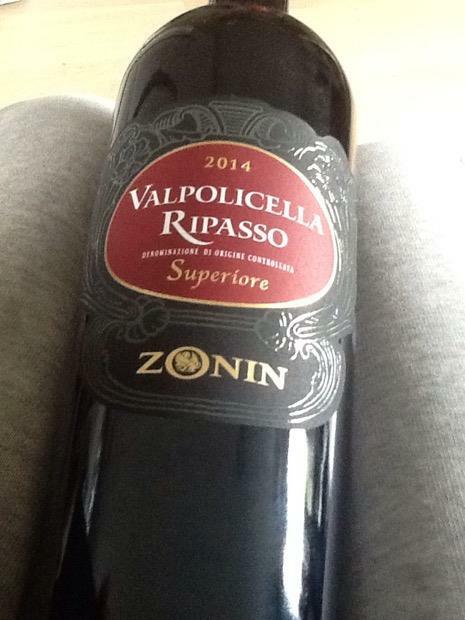 A new wine I have tried in the past week is the Zonin Valpolicella Ripasso Superiore from the year 2014. Valpolicella Ripasso is a meet in the middle, between a Valpolicella and an Amarone. Valpolicella Ripasso became the ‘new’ style of wine late in the 20th century. It means ‘repassed’, and with this technique the pomace of leftover grape skins and seeds from the fermentation of Amarone are added to a batch of Valpolicella for a period of extended maceration. Amarone is a very rich wine, and Valpolicella tends to be a lighter wine. When you pour a Valpolicella through Amarone skins and seeds, some of the flavors of the Amarone tend to come through. I find it delightfully smooth but not as heavy as an Amarone, and they don’t tend to be as expensive as an Amarone. This particular one from Zonin was not only delicious, but it came in under $20. It had nice fruit with some spice on the finish, and I will definitely enjoy it again. Here’s another fantastic find from the week. 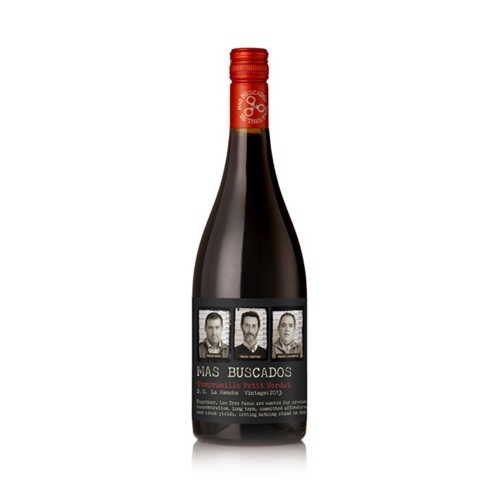 At just $17.99 per bottle, the Mas Buscados Tempranillo with some Petite Verdot is wonderful. This wine hails from Spain and apparently sells very well in New Zealand where they make their own spectacular wine. I loved the subtle flavors of cherry and the hints of black pepper which makes for a super food friendly wine. Great with hearty stews this Winter. Spain produces some wonderful wines and tend to be very good value for the money, this one did not disappoint. Another Valpolicella Ripasso. This is a delicous smooth wine and I can’t stress how good value they are for the money. This particular wine stays on the skins and seeds of the Amarone for 20 full days. 20 days to absorb all those rich Amarone flavors. Amarone gets its flavor from the process of drying out the grapes or ‘raisinating’ them, which means to shrivel them. The unique method that is used is to harvest very ripe grapes and then to let them sit and air dry on mats for extended periods of time is called Appassimento. Amarone wines tend to be very full-bodied and alcoholic wines, but I find the Ripasso method smoothens that out to a degree. Valpolicella Ripasso wines are super food friendly, and will go with just about anything. That’s it for me this week. I know it’s busy, try to find the time to enjoy a glass of your favorite wine.